I hope you didn’t mind my not referring to anyone by their names in the above description, because that’s all you’ll get from the movie. The love interest is sometimes referred to as “Annabel Lee,” but it’s implied that it’s a nickname he gave her because her boyfriend is such a fan of Poe’s work. That’s right, Edgar Allan Poe is actually shown to exist in the film’s universe, with shots of a book containing “The Tell-Tale Heart,” intertitles quoting “Annabel Lee,” and even the famous daguerreotype of Poe turn up in the movie. The uncle fills in for the victim in “The Tell-Tale Heart,” with an eyepatch replacing the story’s “vulture” eye (and the nephew actually has no issue with it) and an actual ghost replacing thumping noises. Some of you might consider the ghost getting revenge to be a cheat since the film’s title gives credit to the young man’s conscience (which might explain its alternate title Thou Shalt Not Kill), but the film actually explains it at the end. Not that I’d blame you if the drawn-out nature of the film convinced you to bail out long before then. Did we really need the scene where the protagonist’s sweetheart rescues a trapped puppy (or those extended party scenes)? 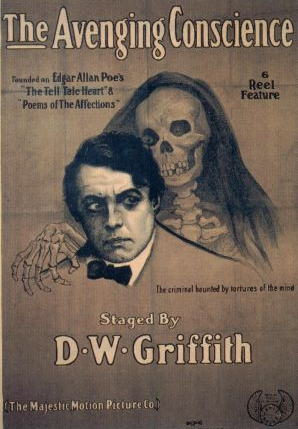 It’s amazing how most of the silent films I’ve reviewed so far had posters that played down their horror-related content, but the film that actually plays it up in its advertising rarely uses it in the film. I also found it very amusing that the nephew decides to kill his uncle after watching several animals feed on each other and concluding that killing is perfectly natural. You just know that some form of media would be the culprit if the film was made in this day and age. Oh, and here’s a fun fact: The director was none other than D.W. Griffith, who went off to film the infamous Birth of a Nation the very next year! Some sources give the running time as 78 minutes, but I suspect this is only due to the projection speed and that the 56 minute version that’s widely available today is the original. As is the case with much of D.W. Griffith’s early work, this 1914 film is in the public domain and available from several home video labels. The best bet for those curious enough to seek out the film is probably Kino’s remastered DVD. I say “probably” because the Amazon listing for it notes that the print was obtained from the collection of Raymond Rohauer, who had a reputation for reediting film prints. That said, my research has yet to turn up any evidence that the film was tampered with. I also understand that Kino’s release includes Griffith’s 1909 film Edgar Allen Poe (sic), which has the distinction of being the first Poe-related movie adaptation ever made. It’s also worth noting that he later went on to create one of the earliest “old dark house” films in 1922, One Exciting Night. That said, I recommend The Avenging Conscience for Griffith and/or Poe completists only.